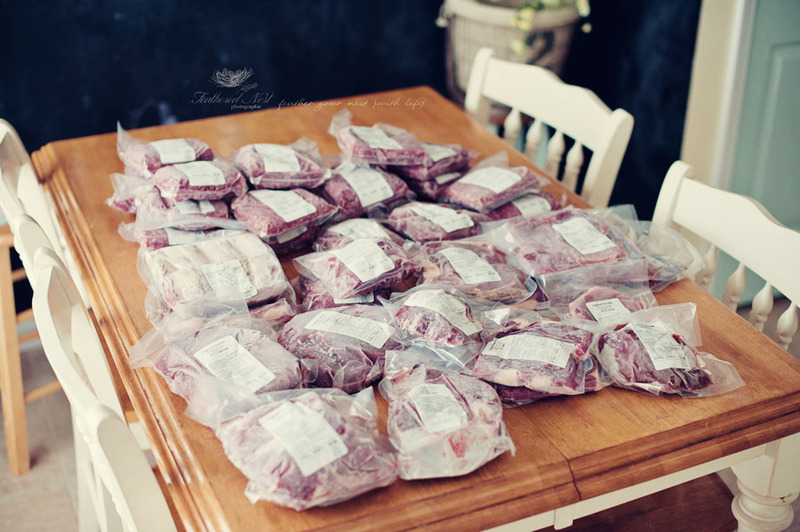 This post is just a simple FYI as to what you might expect if you decide you want to purchase your own grass-fed cow portion. We decided to start small for our first time just so we could get a feel for the process and see how long it takes for us to go through the meat. We ordered a 1/4 but split that evenly with my parents so the order that you see in this post is actually an 1/8. The butcher that processes your beef may vary in his cutting method but ours cuts the steer by halves. If you order a 1/4 he pairs you with another 1/4 order that has a similar cut sheet. In our case the other 1/4 was a friend and we ended up with the exact same cut sheet (by chance). If you are anything like me I had no idea what kinds of cuts to request so the butcher provided a list of each portion of the cow and what cuts can be made with each. He also listed the standard cuts to give you an idea of a typical order. Most of our cuts were similar to the standard sheet but we did make a number of changes that better suited our eating habits. Once we placed our order our steer went to butcher about a week later...kind of a sad thought but it is the truth about where meat comes from. I think it is important for kids to know where meat comes from as well. They don't need to know all the details (if they are young) but they should understand that an animal had to die so that they can eat. I believe this helps them appreciate their food and the process it takes for it to get put on the table. Maybe that's just me. We got the pick-up call yesterday (which was about 2-3 weeks after butcher) letting us know that the farmer himself would be delivering the meat at a pick up spot down the road from us. This is our order breakdown. Our original hanging weight for a 1/4 was 137.7lbs but we split it down the middle with my parents (for payment purposes) which made our portion 68.85lbs. Our farmer charges $3.50 hanging weight which is comparable to many other farms in our area. Lots and lots of ground beef!! 18 packs of it to be exact. We love ground beef so we are excited to have a large amount of it. I'm excited about not having to buy beef from a store anymore...this is soooo much tastier (not to mention way leaner and healthier)!! 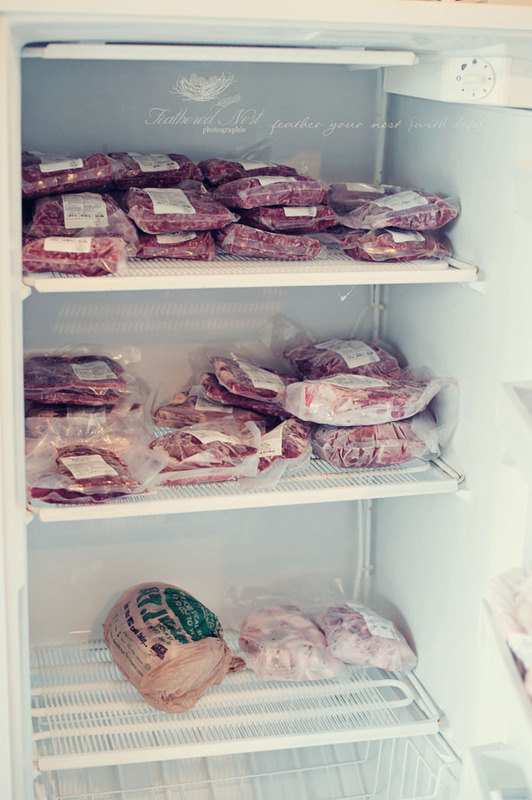 This photo is just for the purpose of showing the space an 1/8 of a cow takes up in a 16cu.ft upright freezer. We found this 4 yr old Whirlpool freezer on CL for a great deal. The top 2 shelves hold the beef from our order and the soup bones are in those other two packages on the third shelf. As you can see we could easily fit twice as much and still have room for lots more food...like chicken!! I would love to do this with my own family...can you tell me what farm you used? btw, i happened across your blog a couple of years ago when i was searching for a local bakery and love it...your pics are beautiful! 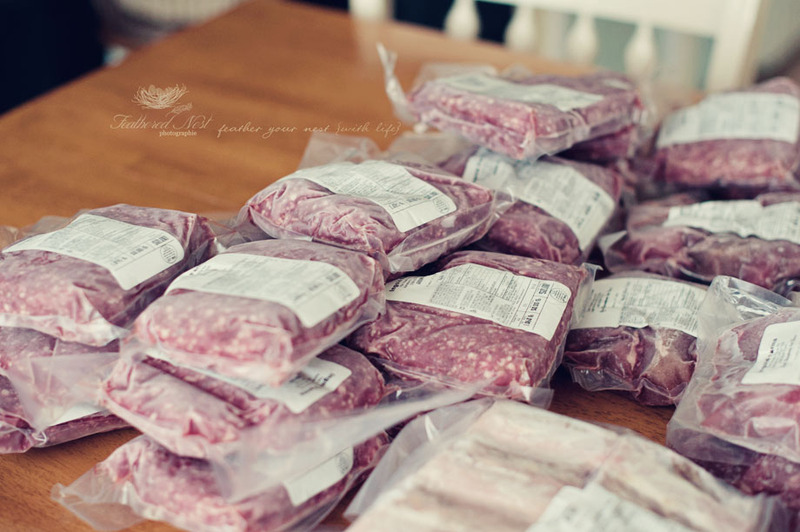 Hi there, thanks for stopping by the blog and for the sweet words about my photos :) We bought our beef through a small cattle farm in Asheboro, NC called Ingold Farms. The farmer is incredibly nice and if you google the farm you will have info to contact him directly! I hope this helps! Buying beef this way is so much healthier for you and your family!! Love the picture of your family on the beach. And the music is a nice touch. I can't find any supermarkets in my area that sells grass fed beef. So I order from La Cense Beef through the internet. Their beef comes to me fresh frozen. Their new catalog just came out. Let me know what you think of them.